Oh my – I love to see pictures! An adorable duo! Makes me remember one I took of my girls their first spring in 2004 (they were about the same size as Titus and Chloe) strapped in the bike trailer with pink sunbonnets on – smiling away like your little sweet ones! What a treasure pictures are – oh and of course so are great picnic blankets! They are adorable. I’m new to the joy of a picnic blanket, but it’s been discovered as a wonderful ‘base’ for my 14 month-old running around outside. I read on the blanket and she comes over to drop flowers and sticks on me. Oh good…I’m not the only one with bald babies! Amanda- I always think it is way better than starting with a lot and then balding into strange patterns. You just got to look on the bright side! They are so cute, Rachel! I love the idea of collecting picnic blankets! I loved letting my babies crawl outside on nice soft blankets. And it would be a wonderful way to make memories. We never see you anymore – but thought you might like to know that Missy is having a GIRL this time! Due September 2. A girl! And about time too! I have been thinking of you all a lot, and wanting to walk down there sometime. Every day something stops us, but we’ll get there eventually! Thanks for the update, and I’ll see you soon. 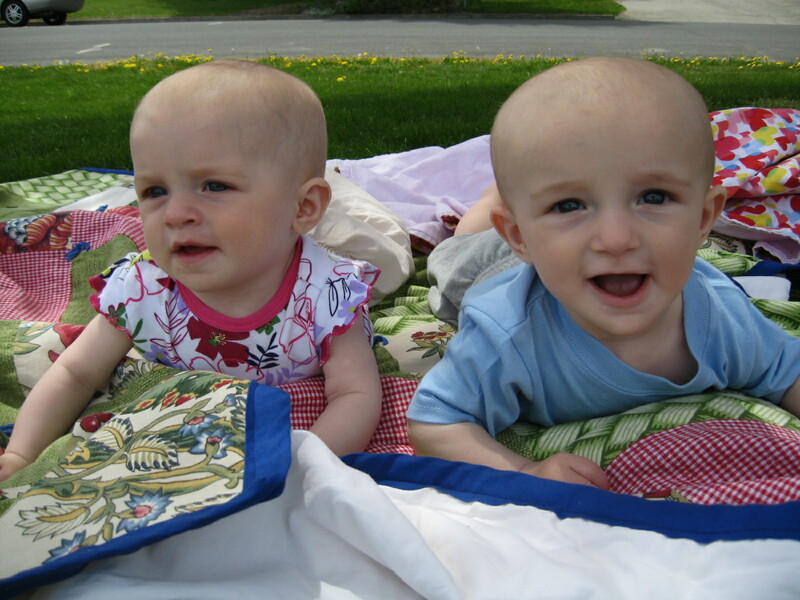 I came across your blog a few weeks ago, this photo is so wonderful, I love picnic blankets too, basking in the warm springtime sun and having cuddles with my precious babies, thank you for sharing this photo!